Dogfish are not difficult to skin, despite all the stories about nailing then to your shed and then setting your Rottweiler on them skinning doggies is easy. Head and gut dogfish as usual and cut off fins then put on draining board and pour a kettle of boiling water over it, pour slowly and take care to cover all parts. The rough skin can now be wiped off with a rough cloth or scraped off with a knife. 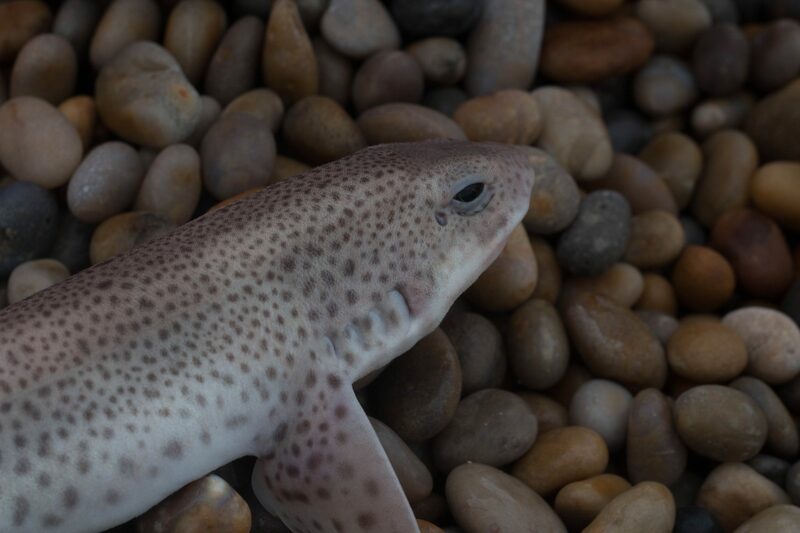 Dogfish (like other members of the shark family) does whiff of ammonia either freeze befor use or marinate overnight in salt water. Cut prepared dogfish into chunks and place in a shallow baking tray. Cut the bell peppers into chunks and arrange around fish chunks along with the tomatoes. Chop some fresh rosemary in to small pieces so that it gives up its oil, mix with olive oil, lemon juice and garlic, season to taste. Brush the oil mixture all over the fish and veg. Lay streaky bacon over the fish. Cook in a hot (200 degree) oven for 20-30 minutes and serve along with juices. Goes well with new potatoes and a crisp white wine.